Visions of the future and turning into people’s thoughts come naturally to Clara Quinn thanks to her inherited Quinn Sense. Unfortunately, it offers no insight into her love life–or lack thereof–especially where hardware store owner Rick Sanders is concerned. But even though she’s still nursing a broken heart, Clara offers Rick a home for his troublesome dog, Tatters. 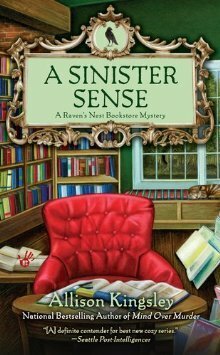 Cousins Clara and Stephanie Quinn from the Raven’s Nest Bookstore are back with another murder to solve in Allison Kingsley’s latest cozy mystery, A SINISTER SENSE. Things aren’t looking so good for Rick Sanders, the owner of Finn’s Harbor’s only hardware store. A dead body is discovered in the back of his truck, and the murder weapon was taken straight from his own store’s inventory. Even though most of the town thinks he’s guilty, Clara just knows he’s innocent. Rick is Clara’s good friend (and even a potential love interest? ), so she’s not going to sit by an let him take the fall for someone else. Armed with her special “Quinn Sense” and her cousin Stephanie’s help, Clara sets out to find the real murderer. A SINISTER SENSE was a quick and easy read, and overall I liked it – not loved, but liked. The mystery was fairly simple, without a lot of twists and turns or red herrings in the plot. Clara was such a loyal friend to Rick, and when others turned their back on him, she stuck to her guns to find the real murderer, even after receiving threats if she didn’t stop snooping. I enjoyed the dynamic between Clara and Stephanie as cousins, best friends and a fun amateur sleuthing team. My main complaint with this book is the same one I had with the first book in the series (Mind Over Murder) – the way the murderer was caught was just kind of silly. Not very believable in my opinion, and that took away some of my enjoyment. I’m crazy about bookstore settings, and the Raven’s Nest sounds like an intriguing shop with its Edgar Allen Poe theme. The bookstore specializes in the occult genre, which is fitting given that certain family members, like Clara, have the “Quinn Sense.” It’s similar to having a sixth sense; Clara hears voices in her mind, giving her vague hints about certain things, or she will just develop a strong “feeling” about something without explanation. Clara is not very good at using her special ability, mainly because she’s not happy about having it in the first place, and for years she’s tried to pretend it wasn’t there. I absolutely LOVE cozies with paranormal elements, so I wish this book had delved deeper into the Quinn Sense. Since I’m curious to see where Clara’s relationship goes with Rick, and I want to know more about Clara’s woo-woo powers, I will be continuing with A Raven’s Nest Bookstore series. I’m just hoping the cousins find a different way to catch the killer next time. This entry was posted in Cozy Mystery, Mystery, Paranormal Fiction, Reviews and tagged 3 Stars, Allison Kingsley. Bookmark the permalink.